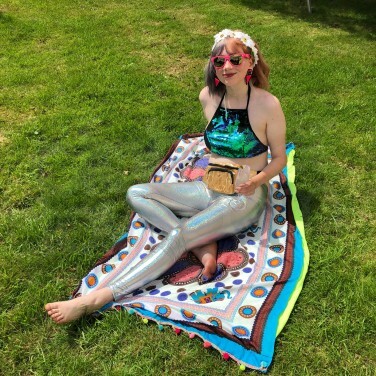 Rock a funky golden holographic bum bag and keep your valuables safe and your hands free to party! 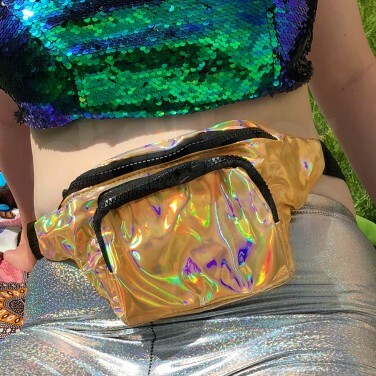 A high shine metallic bum bag with large main pocket and a smaller outer pocket, this funky party bag has an adjustable waist making it suitable for most and allowing you to position the bag comfortably on your waist or hips. Go all out and make a style statement in metallic rainbow leggings at your party for show stopping looks! Shimmer and shine all night long in the most glamorous playsuit ever decorated with golden sequins! Sparkle and shine in shades of green and blue in this show stopping sequinned party playsuit!